We want to to ensure that before you enjoy your fireworks you are aware on how to handle them. We have put togethersome tips and best practices that can be used as a guideline. All of our firework products meet or exceed the standards established by the U.S. Department of Transportation and the U.S. Consumer Product Safety Commission for UN0336 1.4G (Class C) consumer fireworks. Additionally, we test products to insure proper product safety, performance, and compliance with CPSC standards. Fireworks are an American tradition. They can provide hours of wholesome, family entertainment, but must be used by adults carefully and safely. To insure the safety of both the audience and those lighting the fireworks, we recommend you obey the following safety measures during your fireworks display. 1. Children should not handle fireworks. Never let children handle, play with, or light any fireworks. Only adults should handle and light the fireworks. Fireworks should be enjoyed by everyone, but because they burn hot, they are intended to be handled only by adults. 3. Follow the laws and use common sense. Follow your local and state laws regarding the possession and use of fireworks, and use common sense when using fireworks. Read all directions, cautions, labels, and warnings on each individual firework item to understand the product performance and hazards associated with the use of the item. Do not carry fireworks in your pocket. Always be careful in handling fireworks to prevent dropping them. Never smoke when handling fireworks. 4. Use fireworks on a hard surface. Always light fireworks on a hard, flat, and level surface to insure the stability of the items. Grass is generally not suitable for any aerial items. If lighting on grass, lay down a flat wooden board for a shooting surface. 5. Use in a clear, open area. Keep the audience, especially children, a safe distance away from the shooting site. Always light fireworks in a clear, open area away from buildings and vehicles. A minimum clear radius of 30 feet for fountains and ground-based items, and 100 yards for any aerial product is recommended. Avoid lighting fireworks in any area where there is dry grass or brush that could catch fire. 6. Keep clear of the fireworks. Never put your head or any part of your body over the top of any firework product, or hold any item in your hand while lighting. 7. Use care when lighting fireworks. Keep as far from the product as possible and light firework products with a punk, torch, flare, or extended butane lighting device. If needed, use a flashlight at night so the fuse can be easily seen. Never use a lantern or other flame-producing device near fireworks for illumination. Light the firework product and immediately step back. 8. Light only one firework item at a time. 9. Do not use malfunctioning items. Never attempt to re-light, alter or fix any "dud" firework. 10. Always have water nearby. Have a readily accessible fire extinguisher, water supply, hose, or bucket of water nearby for emergencies. Always designate one individual to be in charge of the water supply if a situation arises. 11. Watch weather conditions. Be cautious of lighting any aerial firework during strong windy conditions. The firework should be lit with the prevailing wind blowing away from the spectators. If there is a significant wind shift during the time you are lighting the firework, the shooting site should be rearranged. 12. Fireworks are not weapons. Never use fireworks as weapons! Never aim, point or throw fireworks at another person. 13. Storage of fireworks. Always store fireworks in a cool, dry place and dispose of fireworks properly. 14. Only use fireworks outdoors. Never use fireworks indoors. 15. Do not transport on airplanes. It is a violation of federal law to transport fireworks on airplanes. The Federal Aviation Administration requires us to remind you that carrying fireworks in passenger carry-on or checked luggage when traveling on an airplane. More information can be found on FAA's passenger awareness page. 16. Purchase fireworks from reliable dealers. 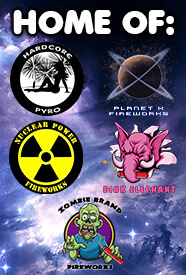 Buy fireworks only from reliable, licensed fireworks dealers. Licensed and reliable dealers will carry only those products that meet standards enforced by the U.S. Consumer Product Safety Commission. 17. Wear eye protection or safety glasses. Safety glasses are recommended for those individuals lighting the fireworks and those individuals in close proximity to the fireworks. For more information on fireworks safety, please visit The National Council on Fireworks Safety.